UPDATE (11/14/13): All page and profile badges have been updated to the new visual style. UPDATE (11/7/13): All +1 and Share buttons have been updated to the new visual style. 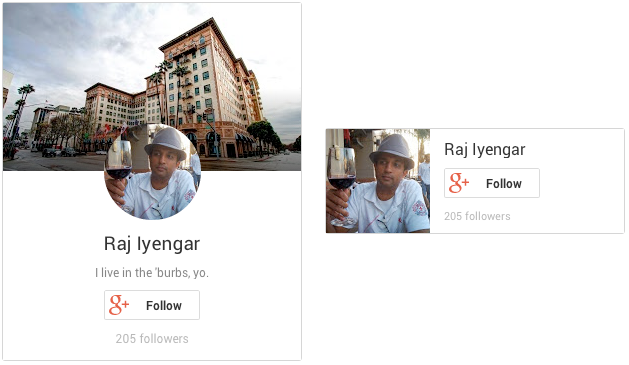 The Google+ Follow button is a standalone plugin that — as you might expect — lets visitors follow you from your site. It’s nice and compact, so it integrates easily with your existing social buttons. You can already see the new Follow button on the following websites: Celebuzz, Cooking Light, Fitness Magazine, and Huffington Post. 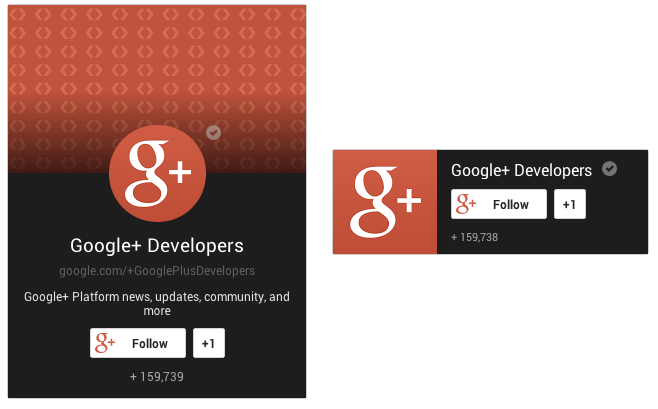 Community managers have been asking for a way to attract members across the web, so today we're introducing badges for Google+ Communities. These badges are highly configurable, making it easy to match your site design. When visitors click the 'Preview' button they'll see your community page in a new browser tab. From there they can view recent posts (subject to your community's privacy settings), as well as join. Returning to your site is as simple as closing the new tab. 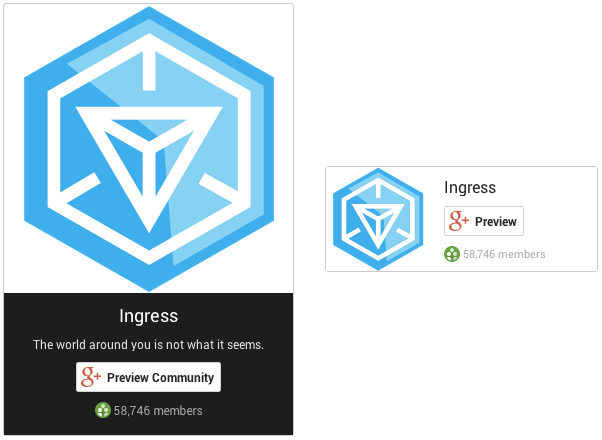 Like the new Communities badge, the updated Page and Profile badges are highly customizable, including portrait and landscape modes, light and dark themes, and turning on/off items like the cover photo and tagline. Existing badges will stick around for up to 90 days, giving you time to configure the new version for your website. After 90 days, we'll automatically upgrade any Google+ badges to the new design. Finally, today's plugin updates include a new visual style that's more consistent with the recent improvements to Google+. This includes the +1 and Share buttons, which will be updated automatically over the next few weeks. We'd love to hear your feedback on today's new features, so follow the conversation on Google+ and let us know what you think!